Bear Cookin': The Original Guide to Bear Comfort Foods takes a good-natured approach to good eating, presenting home-style recipes with a light-hearted touch. Aimed at husky, hairy gay men—and their admirers—the book presents convenient and satisfying recipes for anyone who loves to cook—and eat! Bear Cookin' includes helpful hints, “tributes” to favorite foods, and meal suggestions for breakfast, lunch, dinner—and everything in between—that are guaranteed to please burly bears with big appetites. From lip-smacking snacks to belt-loosening main courses, Bear Cookin’ is stuffed with easy-to-follow recipes for the hearty and delicious comfort foods bears crave: burgers, meatloaf, biscuits with sausage gravy, pasta, potatoes, beans, muffins and bread, cheesecake, puddings and pies, and homemade ice cream. Collected from family and friends and perfect for summer picnic baskets or winter “hibernation” dinners, these filling and flavorful recipes are presented with the love for good food that makes life worth living. 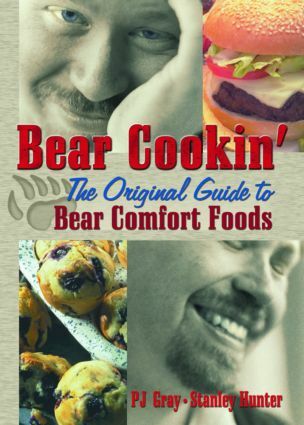 Bear Cookin': The Original Guide to Bear Comfort Foods also includes serving ideas and suggestions for making the best use of your cooking utensils. This book is a wonderful addition to any kitchen—bear or otherwise!